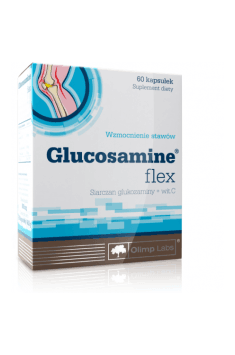 Olimp Glucosamine Flex is a dietary supplement recommended for everyone who wants to take good care of their musculoskeletal system and improve the condition of their joints. It contains highly assimilable glucosamine sulphate of natural origin (crustaceans), potassium chloride, and vitamin C. The components form joint cartilage and other connective tissues as well as support proper collagen synthesis. Glucosamine is a glucose derivative in which a hydroxyl group is replaced by an amine group. It is present in most tissues in the body, and its highest concentration is located in joint cartilage. It is a precursor of many biomolecules, such as heparin, glycoproteins, sialic acid, and chondroitin. Research shows that glucosamine in the form of sulphate is very well absorbed in the gastrointestinal tract. In the intestines, the compound is hydrolysed and free glucosamine is released. Its bioavailability in that case is about 90%, which is almost four times as high as in the case of free glucosamine administration. Additionally, taking it in the form of sulphate leads to further positive effects: its higher levels in blood and tissues, which enables its faster action. Glucosamine has a positive effect on the movement apparatus. Research shows that supplementation with glucosamine sulphate reduces the risk of collagen degradation and stimulates its production, as well as reduces the symptoms of osteoarthritis. Lab tests have demonstrated that it is directly absorbed into chondrocytes, where it boosts proteoglycan production. Another mechanism responsible for the benefits of glucosamine supplementation is direct stimulation of joint cartilage synthesis. Additionally, glucosamine has an inhibitory effect on interleukin 1 (IL-1), which is an inflammatory mediator. Thanks to that, it reduces collagen degradation in tissues damaged by arthritis. In the long term, the inhibition of IL-1 leads to decreased secretion of other pro-inflammatory factors and a reduction of inflammation in the cartilage. Vitamin C actively participates in many biochemical processes in the body. It takes part in the synthesis of collagen, the main protein in connective tissue. Collagen is found in every element of the movement apparatus: bones, cartilages, tendons and ligaments. It gives tissues flexibility, resistance to stretching, and prevents their tearing. Collagen synthesis requires a constant supply of vitamin C in sufficient amounts, which makes it particularly important for athletes and people who do heavy physical work. Ascorbic acid supplementation also reduces cartilage loss and supports its regeneration. Another function of ascorbic acid is preventing inflammation. Because of that, it found application in the treatment of osteoarthritis. The combination of vitamin C with glucosamine sulphate guarantees their efficiency regarding inflammation. Potassium chloride is a salt containing one of the most important cations in the body in a highly assimilable form. Potassium actively participates in the transmission of nerve impulses and prevents painful muscle cramps. Another one of its functions is a cardioprotective effect – it regulates the functioning of the heart, preventing heart attacks. The use of dietary supplements with potassium chloride is especially recommended for athletes and bodybuilders, as their intensive lifestyle particularly forces their hearts and muscles to work hard. To sum up, Olimp Glucosamine Flex is recommended not only for people who want to take care of the functioning of their joints in a complex way, but also for those who wish to prevent joint degeneration or reduce the risk of injuries within the movement apparatus. Thanks to the content of vitamin C, the supplement with help to keep the joints healthy and flexible. Additionally, the preparation can prove useful for menopausal women and seniors who might need to regenerate and strengthen their tendons, ligaments and cartilage tissue. Take 3 capsules a day during a meal. It should be used for a few weeks (6-8 weeks). The best effects of the preparation can be achieved by long-term supplementation, that is at least 4 weeks. Because of the natural origin of the ingredients (glucosamine sulphate obtained from crustaceans), do not use the preparation if you have a diagnosed allergy. Moreover, the following groups should be particularly careful when using the product: people who suffer from diabetes or hypoglycaemia, use anticoagulant drugs, and pregnant and breastfeeding women.